One of the most common disagreements when parents share child custody, but live in separate households, is when and where to drop-off the kids. At first glance, it seems simple: just pick a halfway point between where the parents live. However, there are often logistical and emotional issues that make drop off times and locations more difficult. Ideally, the best drop off and pick up zones will be safe locations where the child (ren) can safely leave one parent’s side and stay with the other parent. Many police stations offer parking spots where parents can transfer children in front of a security camera. Other good locations would be highly public and visible areas, such as a local Starbucks. The most common pickup times are afterschool. The custodial parent can pick up the child (ren) after school without seeing the other parent. Parks are often chosen because of their public accessibility and wide open spaces, but ideally the parents should pick a location where other people can intervene or report if a situation arises. Sometimes, one parent doesn’t have access to a car. Or the parent doesn’t have a license. If transportation is an issue, the parties have a few options. If public transportation is accessible, the exchange point can be at a train or bus station. Bonus points if the station is protected by security guards. Alternatively, the parents could drop off at the other parents home. This is not always an option though; one parent might have been abusive towards the other or because it would be cost prohibitive for one parent to constantly be driving to the other’s residence. Of the two, the cost prohibition would be the easiest to overcome. The other parent can pay additional child support to make up for the price of gas. Spousal or partner abuse is a bigger problem, but neither parent has to speak or interact with each other when the child(ren) leaves the car. One last issue: if the children are young, each parent should purchase a child seat, booster or restraint for their vehicle. Even if neither parent thinks it’s necessary, a judge will likely bring it up and inquire about it. Purchasing that car seat can save your child’s life and save you a lot of grief from the court. Another recurring issue might be if a parent is late or doesn’t show up at all. If the pick-up parent is late or absent, this would place a bigger strain on the custodial parent as it would change the custodial parent’s schedule or plans. However, it is a bigger issue if the custodial parent is late or absent. First, always keep a calendar of such incidents. Mark down which days the other parent is late and for how long, and/or which days the other parent fails to show up. Second, if a parent fails to appear, try to call or text the parent. If the parent is excessively late (more than half an hour), you should also call or text the other parent letting them know you are leaving. You should always make an effort to communicate with the other parent before taking the child (ren) elsewhere. If the other parent is the custodial parent, you should contact the other parent immediately about where the parent and the child(ren) are. If there is no response, contact the police immediately; this situation is parental kidnapping. In some cases, one of the parents moves out of state. If the children are young, be prepared to accompany them. As they become older, the parents and/or the children might wish to travel alone. Maturity will obviously be a big factor in whether that’s a good idea, but courts will give more weight to a child’s wishes as they grow older. The elephant on the plane with air travel is money. Flying will be more expensive than driving around and there’s no way around it. 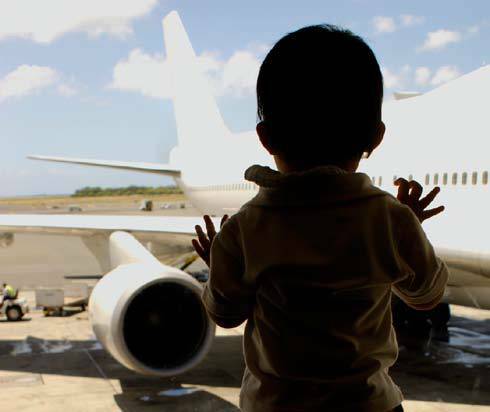 The parents can agree to split the costs of flying, alternate paying for tickets, or have the price of tickets included in one parent’s child support or back pay.